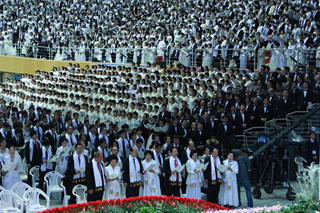 I was fortunate to participate in the event in the Cheong Shim Peace World Center (CSPWC) in Korea, after working hard preparing international candidates for the matching, guiding international participants through the Cosmic Blessing and welcoming, organizing and getting tickets for 350 USA participants for Foundation Day. There are lots of things to reflect upon, but let me briefly address the burden that Mother was obviously carrying. First of all, I am not a mystical, spiritual person, but the atmosphere in the CSPWC was uplifting and powerful. I too was concerned about the heaviness that I had felt from Mother during the Cosmic Blessing. She was clearly stronger and less heavy in the Foundation Day ceremonies, but still seemed weighted down. It was during her prayer invoking the Registration Blessing, where she was choked with emotion and full of tears, that I understood more clearly her burden. She was talking to Father and to Heavenly Parent, begging that the offering of Foundation Day could be received. I realized that this most filial daughter and wife of all, trained and raised by Father since she was 15, had promised Father to complete the offering of Foundation Day successfully. All of her focus, all of her concern, was to do this fully and completely, in the midst of all the transitions and challenges. After that prayer, and the proclamation that followed, Mother began to crack a smile, and her tension lessened. She was all about completing the offering successfully. About 300 VIP guests and 500 church leaders from around the world, here for a leadership conference, were invited to a celebration banquet at Cheon Jeong Gung immediately afterward. 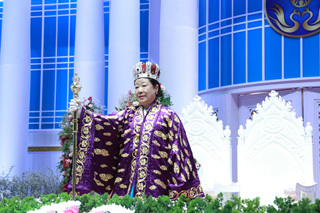 All of us reflected how transformed Mother was at the banquet – in a bright Korean hanbok, warm with smiles, giving the awards to representative members from around the world, receiving representative gifts from each continent, making sure to touch each gift-presenter’s hands. The entertainment was several groups of second-generation Unificationists – each one huge, performing songs of Oceania, songs of Russia, a big group of Japanese kids doing a praise song. The kids were crying, Mother was crying, we all were crying. There was palpable hope in the devotion and innocence of our young people. Mother had asked the youngest couples to sit in front at the Foundation Day Blessing, but the cameras didn’t focus on them. Incidentally, I too like four vows better than one, and other more ceremonial things. 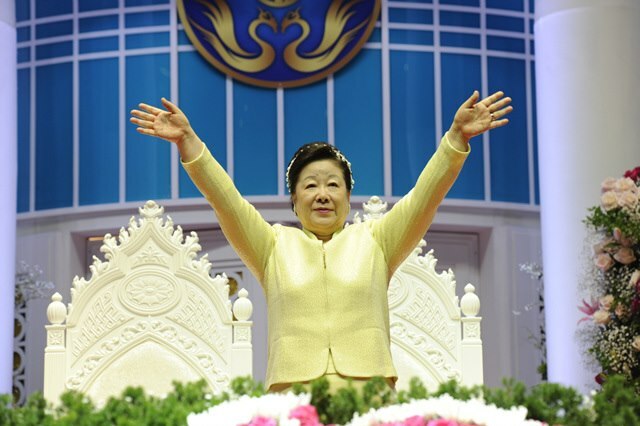 But while all three programs – the Cosmic Blessing, True Parents’ Wedding & Enthronement and the Registration Blessing – were short and sweet, they had the unquestionable stamp of Mother’s urgency and heart. Things were less sloppy, better produced and quick! I felt that after decades of sitting through long programs, trying to cajole Father to end them, sending grandkids with notes, making Father promise, Mother has taken charge! She managed a lot of the details, and everything was no-nonsense. At the same time, things seemed better organized, people weren’t able to sneak in and take seats that didn’t belong to them, and the food and care at the accommodations was better than ever before. Mother approached the matching differently, and announced that there will be a matching and Blessing on a regular day every year, so we can plan, prepare and educate better. She also plans to raise the minimum age for True Parents’ matching to 21, to make sure that participants are more mature and responsible for their decision to participate. She has been meeting with group after group of people who came here. Things are moving fast, and Mother is focused and urgent. Just a bit of what is happening from a closer vantage point.